Posted by liverpoolchamber in 2008, Capital of Culture 2008, Chamber Life, Culture, Liverpool. Here’s a photographic record of the saddest moment of the summer. 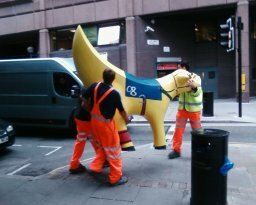 Our very own Lambanana, ‘First Past The Post’ (otherwise known as Lamby) was taken away today and transported to a mystery location lambing shed in preperation for the auction of all the superlambananas on 9 September. Lamby was painted by artist and Liverpool Chamber staff member Pamela Holstein. He represented the Grand National Races, a highlight in the sport and one of our most popular corporate entertaining venues. We’ll all be sad to see the little fellas go. They certainly added a touch of colour and humour to the old place. Posted by liverpoolchamber in Chamber Life, Charity, Health / Lifestyle. Liverpool Chamber’s 5K Team challenge is off to a great start! With sponsorship from Adecco, Ray Ross Print Factory and now 2000 bottles of water and a cash injection from new sponsors Aldi. A new course has been agreed for the former Corporate Cup event, this 5K route uses city centre roads starting and finishing in front of the famous Liver Buildings. The actual start / finish line will be in Brunswick Street outside the entrance to Cunard Buildings. It will then follow a path through George’s Dockway and Mann Island onto Canada Boulevard. Passing through St. Nicholas Place the first 500 meters will be completed at the entrance to Princes Parade where it moves through to Waterloo Road just before the Costco store and then along the main road as far as Cotton Street where it will turn right. Approaching the half way point here it will then turn right again at Clay Street into Carlton Street where it will then turn left at the bottom back onto Waterloo Road to follow the same route back to the finish. With a course as flat as this expect good fast times! Get your map from www.runliverpool.org.uk where you can also get you team entry forms but hurry, your entries need to be with us by Friday 29th August 2008. And your running won’t be in vain! We’ve teamed up with the Roy Castle Cancer Foundation, so that your friends and family can show support by sponsoring every kilometre! We can think of no better reason to put on your running shoes! Posted by liverpoolchamber in Chamber Life, Health / Lifestyle, Sponsors. Liverpool Chamber 5K Team Challenge- arriba, arriba! The holiday season arrived and if I thought of taking a few days off training then I had another thing coming. I gamely packed my running shoes, track pants and a vest, knowing that it would be much too hot to run, even in the late evening. I also knew having been there before that it was a hilly terrain and just taking one look at the size of the hills would put anyone off walking never mind running. So two weeks by the pool it was to be! To my surprise though, RoKo made sure I was up at the crack of dawn every morning so that we could run in the cool air! We’d creep out of the gate so we wouldn’t wake the other residents. How come metal gates always creek? And off we’d go down the road over the speed bumps which weren’t really required to slow me down and on towards Puerto Banus. It was a full 5k to the harbour, so I knew that unless we drove down in the evening I would never see the Ferrari’s and lambo’s in all their glory. With each morning’s run came a new achievement. The downside to it though was the fact that we had to walk back from wherever we reached. Our target was Puerto Banus harbour, so we did not ever consider a circular route so the total distance covered would actually be 10k. I always remembered to to tuck a 20 euro note into my sports bra so that we could get a taxi back if necessary! There is always an upside too, as on the way back we were able to stop at the bread shop to buy freshly baked bread for breakfast. Mind you, it took a deft hand to rescue the very damp 20 euro note required to pay for it! Running is a great stimulant for the appetite, and it increases your desire to eat healthily. I’ve always been a great junk food eater, but now without realising, I’ve ditched much of the chocolate and substituted it for healthy snacks. If you want my recipe for fat free and sugar free breakfast loaf, just send me an email! 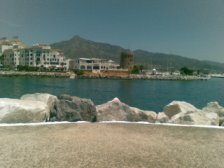 By the third day, Roko and I were reaching the coveted Puerto Banus harbour, 5k from our apartment. The speed wasn’t great but hey we’d nailed the distance! I even had just about enough breath to take in the wonderful views and look longingly at the lambo! The problem with being a running bore is that you never know to whom you are extolling the virtues. Here’s me telling a commonwealth games silver medal winner how she really should take up running as it helps you get fit, lose weight, eat more healthily and gives you an excess of the happy hormone serotonin. How embarrassing! Posted by liverpoolchamber in Chamber Life, Chamber Services, Events. (b) Council are asked to NOTE the resignations of Council members. 7. To formally agree to the adoption of the new “Code of Operation” to prepare for the future Governance of the Chamber. 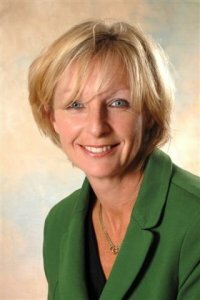 Posted by liverpoolchamber in 2008, British Chambers of Commerce, Business, Capital of Culture 2008, Chamber Life, Culture, Events, Liverpool, Member Events, News. Join us for a networking breakfast with a round up of the previous day’s activities British Chambers of Commerce Convention plus an opportunity to get a first hand look at some of our city’s most exciting economic developments. Following this choose from one of three study tours. Encompassing the new Liverpool cruise facility, ‘Liverpool Waters’ development site, Freeport, Royal Seaforth Container Terminal and site of planned £100 million Post Panamax container Terminal. A 900m private sector-retail led regeneration of Liverpool City Centre creating over 1.6m sq feet of shopping space. To book call Sue Platt or Melissa Bush on 0151 227 1234. Posted by liverpoolchamber in 2008, Capital of Culture 2008, Chamber Life, Culture, Events, Liverpool, News. Liverpool Chamber staff took part in a special ‘school sports day’ on Old Hall Street today to help celebrate Liverpool’s 800th Birthday. In a series of classic events, like the egg and spoon race, sack race and space hopper, er, race, Team Chamber took on teams from neighbouring businesses and organisations. All participants were awarded a special medal for taking part. The Chamber’s very own Paul also received some nasty scraped knuckles, a result of a desperate dive and roll to beat the an army to the finish line. See pictures of the games and other events on the Chamber Flickr page. Other events took place around the city, including pageants and parades and tonight will see a spectacular fireworks display at the Pier Head. There was even a medieval theme in Exchange Flags, with stilt walkers (very big in the 13th century, apparently), and real live birds of prey on display. Surprisingly, no pigeons were anywhere to be seen. More details on the day’s events can be found on the Liverpool 08 website. More pictures from the day can be seen on the Prazzi website. Posted by liverpoolchamber in Business, Chamber Life, Culture, Events, Liverpool, News. As we’ve already mentioned, Old Hall Street and the surrounding area in the heart of Liverpool’s business district will be hosting a street party on 28 August to celebrate the city’s 800th birthday. Old Hall Street will be closed outside the Post & Echo building, 11.30am – 3.30pm but visitors can get round – there will be a traffic management company and stewards to re-direct traffic to car parks etc. Cake making competition – a cook-off contest between chefs. Local pubs will be taking part – Exchange, Cross Keys, Lion are all in the real beer festival starting on the birthday, plus fine foods will be available. Cross Keys – history of stadium/boxing display – former boxers visiting. Exchange Flags will be decked up with a Medieval theme – including falconry (to keep the local pigeons on their, er, toes), archery, jousting and the like – 11.30 – 15.00. Posted by liverpoolchamber in Chamber Life, Events. Over 80 guests attended Liverpool Chamber’s Cocktail Party at Knowsley Hall on 27th June. They were greeted by a champagne reception followed by a wine tasting session provided by J L Lees and Purple Wines. Guests were free to explore the the lavish home of the Chamber’s President, Lord Derby while networking and chatting. You can see photos from the event on the Chamber’s Flickr pages.